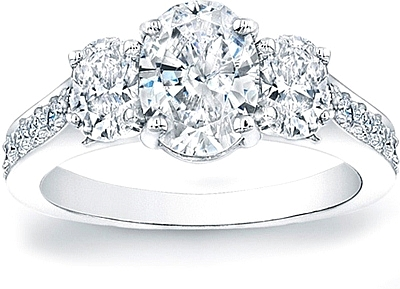 This image shows the setting with a 1.25ct oval center diamond. The setting can be ordered to accommodate any shape/size diamond listed in the setting details section below. This stylish three stone engagement ring setting features two oval side diamonds, as well as round brilliant pave-set diamonds going half-way around the band.<br>This setting is designed to fit flush with just about any wedding band.